Get more business in 30 days, free! Estate sale clients. They’re our bread and butter. But as much as we love them, they can do things that make running your estate sale difficult (and sometimes downright scary)! Unfortunately, these nightmares don’t just happen to newbies. Whether you’re a fledgling estate sale company trying to build your business, or you’re a veteran pro who’s done hundreds of estate sales, it’s only a matter of time before you’ll come up against these types of frustrating situations. After all, it’s part of what makes being an estate sale professional so . . . interesting! Read up on the scariest things estate sale clients can do to estate sale companies — and more importantly, the best ways you can respond to keep your business (and your sanity)! Should you be responsible for removing unsold items and/or a post-sale cleanout? What are your options? a. Be Charitable. Consider packing up all the unsold items ready for pickup or donation to make it easier for the client, and spot sweep the house. b. Add it to Your Contract. Some estate professionals consider a clean out to be a separate, billable service. Consider charging extra for clean up and trash removal and market it as an extra service. Whatever you decide be sure to spell in out in your estate sale contract. c. Compromise. One estate professional said for big cleaning jobs, she and the client split the cost. The estate sale company pays for the dumpster, and charges by the hour to fill it. Hazardous material, like mold, mildew, or animal droppings gets an upcharge. d. Walk Away. Your contract should clearly state all services you render. If it’s not covered in your contract, you’re not responsible for the service. It’s that simple. Your client calls because she needs to downsize after the death of her husband and wants to sell off the estate to pay outstanding medical bills. After assessing her house, which includes Precious Memories and Beanie Babies collections, plus a framed Blue Boy (and Pinkie), among other hard-to-sell estate sale items, you realize: there is not enough to sell. How do you break the news to the client without hurting their feelings? a. Be Upfront. Let them know how much they can expect to make on the sale and give them a choice of a sale or clean out. If they know the clean out is cheaper, chances are they’ll choose this option, and you won’t have to be the bearer of bad news. b. Charge for a Clean-Out. Let your client know that while holding a sale won’t be profitable, you can help with cleaning out. Then charge by the hour or a flat rate. The upside is they will appreciate your honesty and you can feel good about helping someone in need. factor in things like commission, they can be left with an enormous amount of sticker shock. And guess who gets blamed? How do you deal with a client who is upset about the results of sale? a. Manage Expectations. Sit your client down beforehand to explain the differences between retail, resale, and replacement value and how they relate to the current marketplace. (Using the value of a new car vs a used car may be a good analogy). Explain how appraisal and pricing works, and how region/location and supply/demand play into it. Then show them a copy of the settlement to illustrate how the accounting process works. Some estate sale professionals handle this during the initial consultation, so there are no surprises later. b. Prove It. If your client has beef with your pricing, you may show them comps to “prove” the price point or articles from reputable publications, like the The New York Times or industry-related content, like ASEL or NESA that discuss the current market. Getting a non-biased second opinion may be just the thing to put your client at ease. c. Practice Empathy. It’s no fun having to tell a client that they can expect beans for their prized possessions. Be kind and let them know your expertise in this matter. Try to instill trust so they can be confident you’ll do your best to make the most money possible. Remind them of the non-monetary value they enjoyed, whether from the item or collecting. Remember, part of being an estate sale professional is dealing with clients in tough situations. Let the other companies be the jerk, while you secure a reputation for being compassionate. You and the client have signed the contract and are ready to go. The next day, you come to set up the sale and see that all the high-end items (gardening equipment, electronics, art, designer furniture, etc.) and even the vintage Pyrex have been removed. How do you respond to this situation? a. Charge Ahead! When an item is missing from the sale, consider it the same way you would a sold item. Charge the estimated sales price (some charge 50% of the market value) and deduct it from the amount your client owes. Be sure to include the missing item on the itemized list at the end of the sale. Again, as always don’t forget to outline this in your contract. b. Reserve the Right to Cancel. Consider covering cancellations in your contract. (This can cover both the client and the business, by the way). One estate sale company owner’s contract states that if she cancels the sale prior to the sale, she is owed nothing. However, if the owner cancels the sale, they are liable for all work done up to the sale (as outlined in the contract). Another estate sale professional charges a minimum and a cancellation fee. c. Know When to Fold ‘Em. Even if you haven’t covered anything in your contract, if you’re in a situation where it would be more profitable to just walk away, then do it. Only you know what is worth it and what you can handle – monetarily and emotionally! Taking care of yourself first is the best way to better serve your clients who do play by the rules. We get it. Clients often are not at their emotional best, and while they need to get everything done in a timely manner, it can be hard to get some of them moving. 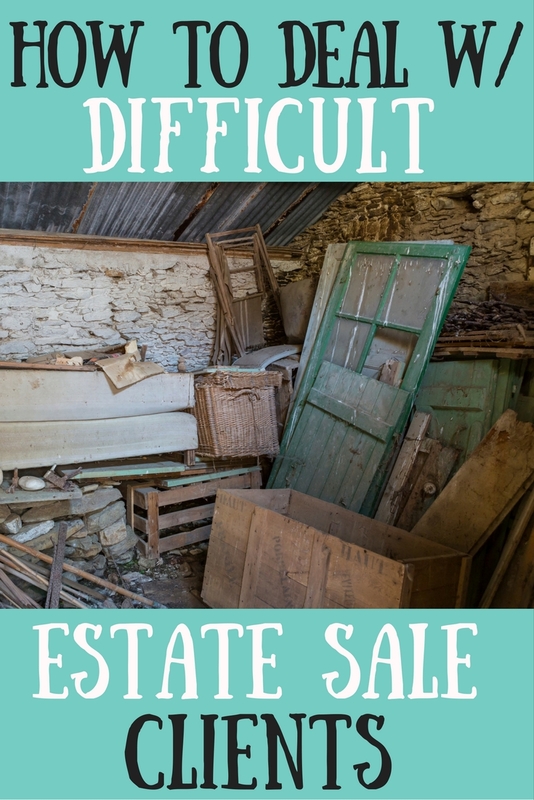 Whether they’re dealing with emotional trauma or the house itself it a giant undertaking (and often it’s both, plus financial woes), clients who wait until the last minute can make it difficult, if not impossible, for an estate sale professional to do their job. How can you motivate your client to get moving – and should you? a. Pass the Baton. Look for auction companies that specialize in quick liquidations and are used to getting the ball rolling with this sort of thing. b. Lay Down the Law. It might be time to get real. Just sit your client down mano a mano (or like a child, whichever works) and tell them the truth: that in order to do the sale, they need to co-operate. Let them know the alternative options (which usually aren’t great). There’s a good chance they’ll co-operate when they see this is their final opportunity, and their money is on the line. c. Concede to the Contract. When in doubt, refer to the estate sale contract which should have dates and times notated for easy reference. d. Be Kind. Whether your client is grieving, hoarding, or is in major denial, understand what they’re going through and be willing to work with them. One estate sale professional worked with a client room by room. While this was tedious and she didn’t make as much money as she might have, going slow was the only way her client could move forward, and together they were able to make progress. It makes the estate sale professional’s job that much more difficult: the client who doesn’t want to leave during the sale. Of course they have a million reasons why they should be there: they can tell the history of the items, they can add a personal touch, they know where everything is. Don’t be fooled. This is a hot topic, as everyone has their own way of doing business, and each client’s situation is unique. How do you deal with the client who won’t leave? a. Set Ground Rules. Your time is money and your client should view it as such. If the client insists on staying at home, be clear how you don’t want them to interfere with your work, including hovering, negotiating, and tampering with items. They hired you to do a job, which is to make the most money for their estate. If you’re set up to fail before you even begin, both of you lose. Don’t be afraid to be assertive. vbb. Batten Down the Hatches. See the #4 about taking items before a sale. Be clear that staying at the home does not mean picking through the estate sale items, especially after pricing and appraisal. c. Add Shiny, Sparkly Objects. Clients are people, and people can be like cats: easily distracted. One estate sale professional had the brilliant idea of putting together activity folders with fun events in the area and through in a gift card to the movies. Warp it up like it’s a gift, and your client will appreciate the kind touch (plus, you’ll have the space you need to succeed). d. Roll the Dice. You can always just take your chances. Not all clients are emotionally distraught, stressed out, or have meddling natures. If you’ve been in the business awhile and are a good reader of people, you can figure out who may be a potential problem at the sale. Many estate sale professionals have conducted sales where the home owner or family were present, and they stayed out of the way and were helpful. You never know! e. Charge Extra. Some estate sale professionals charge extra commission for folks who insist on staying in the home. There’s a good chance, they’ll take the hint and decide against it. f. Avoid, Avoid, Avoid. And then support your case. Some estate sale professionals will not even think about doing a sale when the client is there because it ultimately ends up costing money. Why? They get in the way, they interfere with pricing, they distract (or creep out) customers, they can get emotional, among other things. It is bound to end badly. You’ve met the client, you’ve gone through her things, which include the usual china and brown furniture, but also some nice fine art and antiques. The contract is ready to be signed when the client has one last minute request: she’d like to be in charge of just one tiny detail: appraisal and pricing. Assuming your client doesn’t have ISA after her name, this can leave you in a bind. Should you let someone else control the pricing? a. Flip the Script. If you do take the sale, realize your job title no longer includes a big part of your regular work — appraisal and pricing. Since your job will be a bit different for this estate sale, adjust your pricing. Since your role is essentially labor, change your commission to an hourly rate and charge the rental of equipment and supplies. Chances are you’ll come out ahead in the end. b. Cover Your Bases. Allow the client to do the pricing, but make sure you still get paid. Put a clause in your contract that says you’re entitled to get paid, regardless if the items sell or not (due to being under or overpriced). Your client might think twice. c. Take the Bye Road. As always, you can reserve your right to refuse the sale. Some estate sale professionals have been burned too many times by letting amateur clients take the reins. Pricing is a big part of estate sales — and how you get paid. Best to let the professionals run the show. Your client lives in a gated community with a strict Home Owners Association (HOA). HOAs can impose a number of rules that can pose problems for your estate sale. You might be told the owner needs to call in each guest, or that guests need to be accounted for on a guest list. Among other issues with HOAs: signage limits, special permits needed ahead of time, and other things that can delay the estate sale process. How best should you respond? a. Change Venues. Some estate sale professionals contend that a house subject to HOA rules and can limit success and reduce earnings. Your best bet might be to move the sale to another location altogether. While this is usually not an option for most liquidators, it may be in your best interest to look up a place to rent as an alternative. b. You vs. HOA. You have a few options here. You can try to reason with the HOA, appealing to good old common sense. Let them know you are a professional, provide references, and show you’ll maintain the integrity of the external property (Put them at ease that you won’t have old couches out on the lawn). Tell them the event and parking will be overseen by your staff. Or try sweetening the deal. Whether that means you have to kiss up, grease their palms, or just bake them some cookies, do what you have to do. As they say, you can catch more flies with honey! c. Find a Work-around. Try something like scheduling appointments ahead of time. While this may be a challenge, it could be worth it if the alternative is giving up the sale altogether. And as many estate sale professionals will admit: gated communities can be very lucrative and worth the extra hassle. d. Just Say No. As tempting as it may be to conduct your sale, the smartest thing might be to decline. No matter how well you market and advertise, gated communities make it too difficult for crowds of buyers to gain entry – and many estate-salers won’t even bother. While your potential HOA client may be sitting on a treasure trove, keep in mind you won’t reap any benefits if you can’t sell the items in the first place. Thanks to TV shows like Hoarders, estate sale professionals aren’t the only ones who know about this disturbing mental affliction — but they’re usually the ones who have to deal with it up close and personal. Conducting estate sales is a service, as we all know, and people who hoard are entitled to these services, same as anyone else. Plus, helping people has its own rewards. However, there are serious hazards to consider that may put you in jeopardy: disease, filth, critters, and a mental condition which makes it difficult to let go of stuff (thus making it difficult to conduct a sale). You need to look out for you and your business first. Should you accept a hoarder client? If so, how can you ensure success? a. Grin and Bear It. Enlist your friends (or more realistically: hire staff) to do a pre-clean. Don’t forget gloves, plastic wrap, flashlights, and masks. Charge extra for the extra cleaning work and supplies, and do your best to work around your client’s anxiety (while managing your own stress levels). Not for the faint of heart! b. Be Compassionate. People who hoard are suffering from an enormous amount of anxiety. Remind them that it’s in their best interest (and yours) to cooperate. Be gentle and talk to them like a human being. Kindness may go a long way to ease their fears. Involve the client’s therapist or family if they’re willing to help. c. Make an Exit Plan. For your client, that is. Because of the high anxiety natures of these clients, having them away from your sale is the best way to ensure success. Clients who hoard have been known to get cold feet the day of, so the farther away you can get them from their departing things, the better business you’ll have. d. Run Far, Far Away. When you add up the number of headaches it takes to pull off a successful estate sale of a hoarder, you may be better off walking away. Between the extra cleanup, the client’s high anxiety, possible health hazards, and the sheer amount of stuff to sift through and price, it’s a big job without a big payoff. Be honest with yourself when deciding to take on one of these kinds of jobs. Now it’s your turn to weigh in. What difficult client situations have you encountered before, and how were you able to resolve them? Tell us your story in the comments below! Subscribe for quality content on running your estate sale or auction business, plus important industry news. Our blog for shoppers covers antiques, collectibles, vintage finds, and all things estate sales. 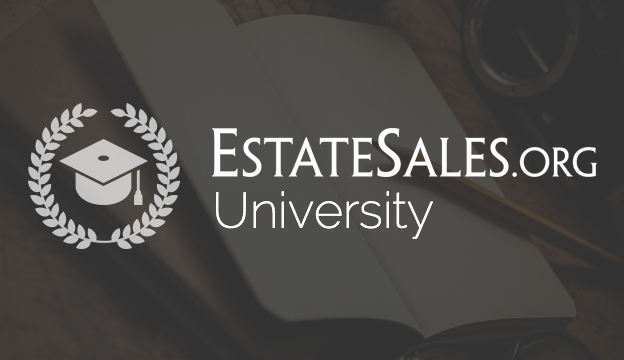 Connect with other professionals on the biggest Facebook Group for estate sale companies.